This company has operated on responsible tourism values since its inception. From an environmental perspective, our initiatives extend from our company offices to our tours. A local green energy provider powers our head office and stores; we encourage cleaner transportation methods for staff, and purchase all supplies from a local green business supplier. Our office is as paperless as possible and our brochures use 100% PEFC certified sustainable paper. We offset emissions from all corporate flights and our marine vessel, and encourage our travelers to do so by providing an online platform through Sustainable Travel International. Low Impact Transportation: Vietnam has lots of options for getting around making less of an impact. We always try to use local transport. 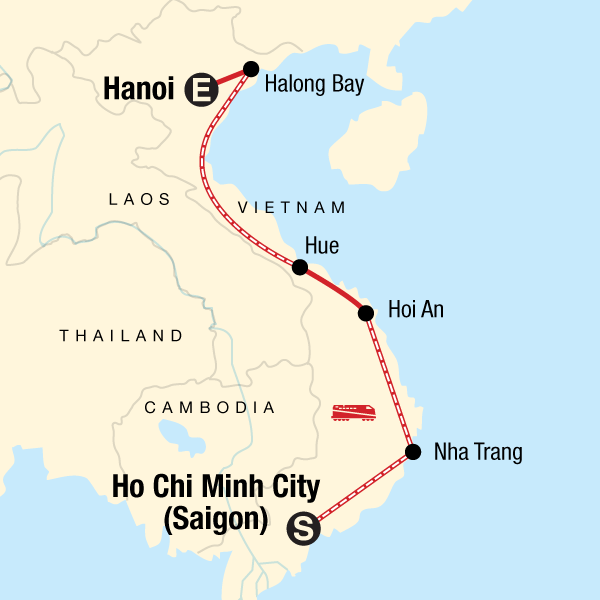 This trip gives you the chance to try out the overnight sleeper train from Hue to Hanoi, experience a “junk cruise” in Halong Bay and touring around Ho Chi Minh city by “cyclo” is the best way to see the sights. Getting around as the locals do not only allows you to experience the culture on a deeper level, but the same way it is at home, using public transport is the most sustainable way to go – after walking and cycling of course! Support World Heritage: On this trip there are numerous opportunities to visit important heritage sites such as the picturesque port town of Hoi An with its “living museum” and famous markets, the dramatic islands of Halong Bay, Hanoi’s Old Quarter, the Tien Mu Pagoda, among others. Celebrating world heritage is an important way to participate in sustainable tourism. Many world heritage sites are designated for protection so that all the world’s people can share in these fascinating and historical wonders for generations to come. Supporting communties is and always has been at the heart of our tours. We provide business opportunities to local people by employing local guides and tour operators. The majority of accommodation used on our tours are small-scale, locally-owned hotels. Our tours mainly use public transportation wherever possible and are small in size to keep our impact on fragile sites and communities as minimal as possible. We monitor the sustainability of our tours through traveller evaluations in order to allow for continuous improvement. We support the local economy and business initiatives by visiting locally-owned shops, restaurants, and markets on our tours. Many tours incorporate community projects as a way of supplementing community income and supporting community development projects. In 2003 we founded a non-profit organization as a way for our travellers and our company to give back to the people and places we visit. We develop community projects around the world in the areas of health, education, small business development and environmental conservation. Funds are raised through traveller donations and fundraising. The company pays all administration fees which means that 100% of each individual donation goes directly to the community projects. Each year, we continue to support and develop new partnerships with more community projects and community-based tourism initiatives worldwide, in Latin America, Asia and Africa. Local Accommodation: Accommodations used throughout this trip are locally owned simple guesthouses, managed and staffed, with profits going directly to locals. This is a major contributor to the sustainability of a trip because other types of holidays where the majority of the trip is spent in a large foreign-owned resort means very little income stays in the local economy. Supporting local businesses, culture and community development: There are a multitude of opportunities to support local businesses and immerse yourself in Vietnamese culture on this trip. From the colourful markets to the bustling food stalls and cafes, the choices for eating and handicrafts are endless and the money is staying in the local economy - a vital way for tourism to make a positive impact. Activities that take you to markets, locally owned restaurants, and villages are vital to the local peoples’ ability to truly benefit from tourism. Our style of trip, travelling and eating with the locals, puts you right at the heart of Vietnamese culture. - Drink bia hoi with the locals and make some new friends! You do so many things on this tour it is hard to choose the most memorable. If there was one experience I remember the most it was the motorbike ride around the city of Hue. We rode through the streets and out into the paddy fields and local villages. It was the best way to see the country and the whole group had a lot of fun. Just go on and book it! I found getting my visa before travelling a lot easier (rather than visa on arrival) and there are no 'special' vaccinations or medication you require to travel, as there is minimal to no malaria in Vietnam and no other nasty things around. Absolutely. As part of our tour we enjoyed two 'Homestays' which included staying with local families, enjoying their hospitality and understanding how they live, not least sampling the local rice wine! Overall superb. Exceptional value for money and bags of things to do yet you can still find some time on your own if you prefer.